Watermelon salads have become something of a summer staple in my house. Just what this weather calls for! This is a sort of beefed up (or ducked up, I suppose) version of this salad and it makes the perfect summer supper*. *Even for the most hardened of salad dodgers. Pre-heat your oven to 160C/350F. Place a wire rack over a baking tray and pop the duck legs on top. Sprinkle with salt and pop into the centre of your pre-heated oven. Roast for an hour and a half. Once the duck’s done, put it to one side to rest on its rack. Meanwhile you can chop up your melon. Cut into bite sized chunks and place into a big bowl. Grab a handful of mint and use some scissors to roughly chop it over the top. Do the same with your coriander. Then throw on some sliced chillies. Grab a couple of forks and shred your duck, like you would for a Chinese takeaway. Throw it all in to the bowl! In a jar mix your soy sauce, fish sauce, sesame oil, and lime juice. 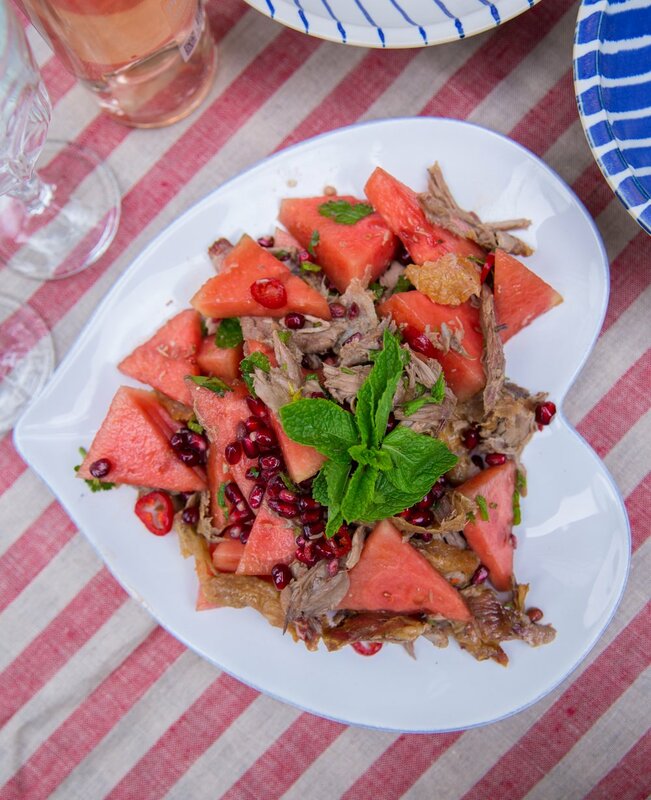 Serve with the duck still warm and the melon beautifully chilled. The perfect seasonal combo of sweet and savoury, all in one beautiful dish. Nibble on some of that crispy skin, balanced with the zingy pomegranate.